I was really looking forward to this movie ever since I saw its trailer. I’m a huge Tom Hardy fan and I think he’s one of the best (if not the best) actors working in Hollywood at the moment. On the drive to the theatre, I started thinking how odd it was that I hadn’t heard any reviews or recommendations with regards to this movie. There was no hype and, after seeing this movie, I see why. 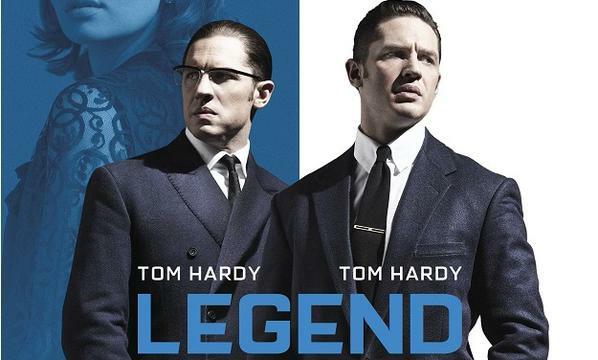 Okay, basic plot: Ronnie Kray (Tom Hardy) and Reggie Kray (Tom Hardy) are twins and the crime princes of London in the 1950’s. Reggie is the brains of the operation and the more sensible of the two while Ron is a paranoid schizophrenic with a real lust for violence. When Reggie meets and falls in love with Francis, he considers leaving his life of crime and walking the straight and narrow but Ron won’t allow this, constantly pulling Reggie deeper and deeper into the criminal underworld. Reggie and Ron set about on a crime spree that will rock London and write their names into legend. This movie is one of the most boring movies I’ve seen this year. I’m not joking when I say that from the very first second of this movie, I was filled with a sense of dread. This film’s story is told from the perspective of Francis – Reggie’s wife – who also acts as narrator. I think most people underestimate the art of narration, you hear Morgan Freeman do it and think it’s as easy as reading a few words of a page but it isn’t. Emily Browning is a horrible narrator. There’s no emotion in her speech and she lacks a commanding storytelling presence. Hearing her narrate felt like I was listening to an annoying member of the audience comment on the events of the film rather than the actual storyteller conveying the story to me. I’m struggling to understand why the filmmakers chose to tell this story from Francis’ viewpoint. Yes, she’s a major character and influence to the story but she isn’t the main character. I came to watch this movie to learn about the Krays, I was expecting a crime biopic that shed some light on these apparent legends of London crime but instead was presented with a sappy romcom that provided very little insight on the supposed ‘main characters’ of the film. This movie is about gangsters but there’s so little crime in this movie. I knew nothing about the Krays and their criminal activities walking into this movie and after watching this movie, I feel like I know less. If I go see a biopic about an athlete and we don’t see the athlete participating in the sport that made them famous, then I’m going to be disappointed. If I go watch a super hero movie and we don’t see the hero in tights saving people then I’m going to be disappointed. It isn’t rocket science, stay true to your genre and give the people what they want! 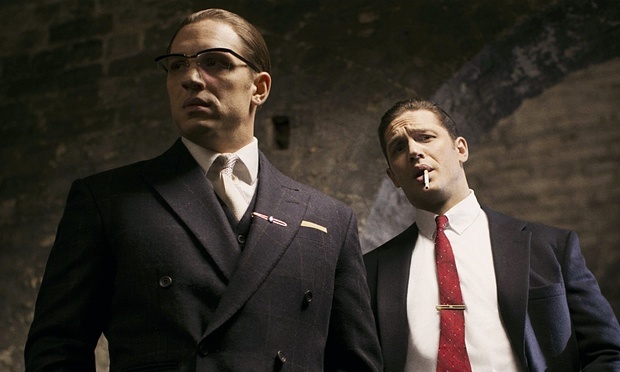 This movie’s saving grace is Tom Hardy and Tom Hardy. He does such a phenomenal job creating a rich contrast between the two brothers. The two characters are very different and Hardy’s performances are filled with so much depth and insight that he fools you into thinking that the twins are played by two separate actors. It is superb acting, I’d say even worthy of an Oscar nomination. Hardy also has such great chemistry with himself. The bond these two siblings share is unbreakable and Hardy brings this to life with great skill. While I didn’t appreciate Emily Browning’s narration, I thought her acting was superb. I do think her character was given too much focus but Browning does good work. 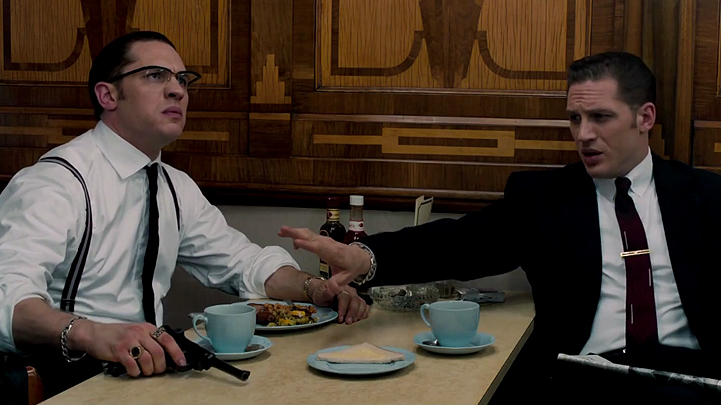 There are some amazing moments of violence in this movie, in particular, a bar fight between the Kray twins and a rival gang. It reminded me a lot of the ‘church fight scene’ in Kingsmen. When this movie does get down to being what it’s supposed to be (a gritty biopic about gangsters) it’s extremely entertaining to watch. The violence is graphic and has a great raw feel to it. The violence doesn’t feel choreographed, these men are brawlers and that really comes across in the way the fight scenes are set up and filmed. Unfortunately, these scenes are few and far between and you have to suffer through a myriad of sleep-inducing dialogue to get to them. This film felt like it was screaming out for Guy Ritchie. Brian Helgeland who wrote and directed this movie just doesn’t know how to tell this story. His focus is completely off. We never get a proper sense of the rival gangs the Krays have to beat off or what crimes exactly the Krays are involved in. All the things that should be the focus (the crimes, the violence) are relegated to the periphery; while things that are B-story (Francis) are given centre stage and this movie really suffers for it.